Totally flexible duration with no fixed contracts – choose as few or as many content placements as you want each month. Combination of new guest posts that link to your content and contextual links inserted into existing articles. If a new guest post is needed for a given website, we are happy to write the post or have you write it. You select the "tier" of publication you would like and pay per-publication. Pricing starts at $150 per content placement. Exact price depends on quality of the publication. We were approached by a startup financial technology company that was looking to get more milage out of their existing content through external backlinks. They had already invested substantially in onsite content and traditional PR, but were lacking a repeatable back linking strategy to rank for more high-intent keywords on Google. Objective: Gain backlinks to existing content on renewable-energy and finance related publications with strong traffic metrics and domain authorities. 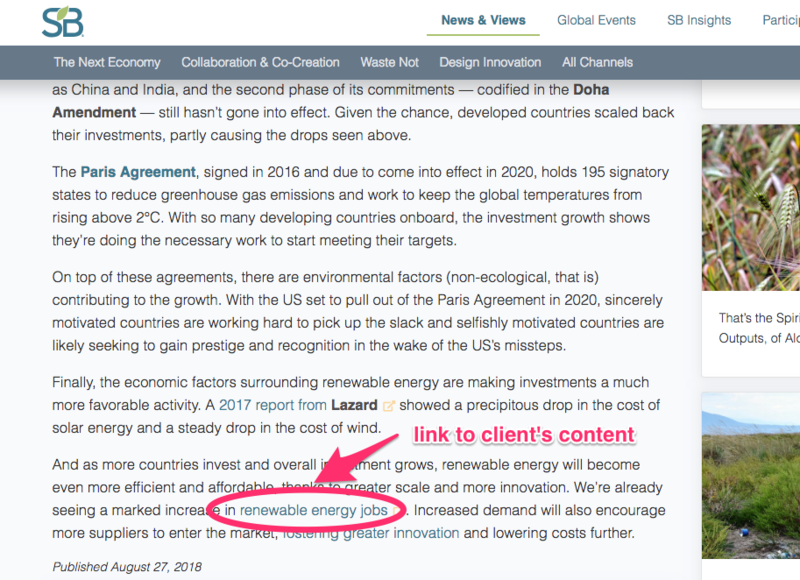 Strategy: Identify win-win opportunities within renewable energy and finance blogs where our client’s content could immediately add value to an existing article while also garnering a backlink to our client’s website and bringing in more direct traffic. 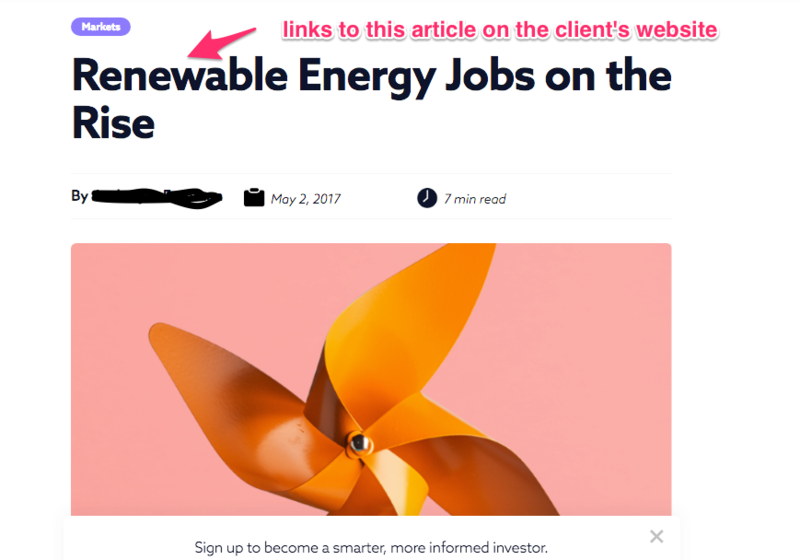 Strategy: Identify win-win opportunities within renewable energy blogs where our client’s content could immediately add value to an existing article while also garnering a backlink to our client’s website and bringing in more direct traffic. 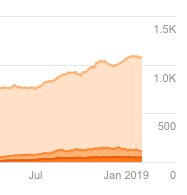 While one link doesn’t move the needle much on its own, repeating this strategy dozens of times over a 6-month period yielded a 43% increase in keywords ranking for the client.